However in this case, the artist is not interested in the material’s traditional uses but rather in activating its physical qualities: the fact that the small air capsules explode under pressure. This is, of course, well known. 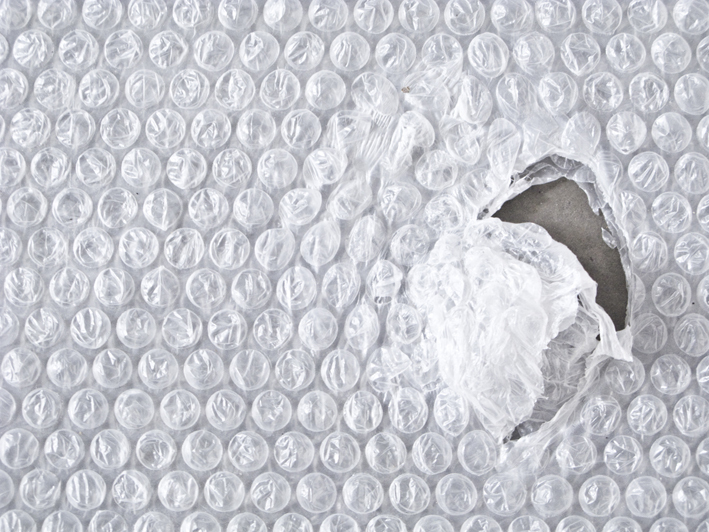 More than once we all have held a piece of bubble wrap in our hands, and have played by popping it just for pleasure, almost unable to stop. But it is an entirely different situation when the material is on the floor of a space you wish to enter, in which you find yourself engaged in a sort of inevitable participation, where you cannot avoid making noise while walking around, revealing your presence and leaving an audible trace of your movements. You have been entangled in a situation that is slightly improbable, setting aside the utilitarian expository structure. You mostly likely took care when coming in, entering calmly, and relatively quietly. Perhaps, instead of popping, you would have preferred to go unnoticed. Or on the contrary, perhaps you would react with excitement, trying to explode more and more bubbles, walking on areas that haven’t been stepped on yet, and thus changing the typical route through the space, alternating the way in which you would normally circulate through it.